We are your parents, your spouses, your lovers. We are your brothers, sisters, children. We know the secret war you wage and were willing to make great sacrifices for your sake. Yet were less than equals in your society only mortals, you say. But could you do without us? You need us. Were Kin. 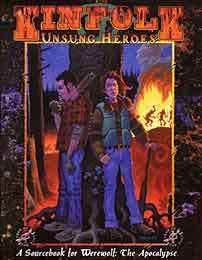 Kinfolk: Unsung Heroes deals with the mortal relatives human and wolf of Garou. Learn what its like to be the poor cousins to werewolves, the family members with the heaviest responsibilities of all. See what inspires loyalty in Kinfolk and the treatment that turns so many against the Garou.